Not all biologics are equal! 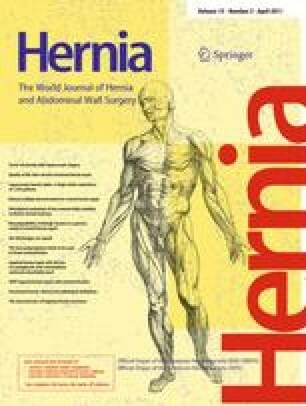 Although the efficacy of various biologic meshes in the abdominal reconstruction of complex ventral hernia has been shown, the performance profile of various biologic mesh scaffolds in terms of hernia-specific outcomes such as recurrence, mesh explantation, and mesh infections has not been examined. To evaluate the clinical outcomes of patients who underwent complex ventral hernia repair with bioprosthetic material. This study is a retrospective analysis of the use of bioprosthetic material in complex ventral hernia at an academic institution from January 2002 to December 2007. A total of 58 patients with a mean age of 57.2 years and mean body mass index (BMI) of 33.8 who underwent reconstruction of ventral abdominal defects with a bioprosthetic from January 2002 to February 2009 were included in the study. The study patients had about 4.8 previous surgeries and 43.1% of patients had reconstruction in a setting of enterocutaneous fistula, while 46.6% had a previous mesh infection. Complex ventral hernia was seen in 50 patients, while eight patients had ventral and parastomal hernia. The type of biologic used for reconstruction was human-derived (AlloDerm, 29), porcine cross-linked (CollaMend, 3; Permacol, 2), and non-cross-linked porcine (Surgisis, 16; Strattice, 8). At least one complication was seen in 72.4% of patients. Major complications noted were surgical wound infections (19.0%), seroma (8.6%), and abscess formation (5.2%). The one-year hernia recurrence rate was 27.9% and mesh explantation was needed in 17.2% of patients. AlloDerm was less likely to be explanted (13.8%) or become infected (37.9%) but more likely to recur (28.6%) compared to porcine cross-linked bioprosthesis. Porcine cross-linked biologics were more likely to become infected (60%) and explanted (40%) but less likely to recur (20%) compared to AlloDerm. Non-cross-linked porcine biologics were less likely to be explanted (16.7%) but had higher recurrence (29.4%) compared to cross-linked porcine biologics and a higher infection rate (54.2%) compared to AlloDerm. The results from this study underscore the difficulty of repairing complex abdominal wall defects in contaminated fields. Cross-linked porcine biologics showed relatively higher infection and explantation rates. Equivalent recurrence and explantation rates were observed for the non-cross-linked porcine biologics and AlloDerm. These data indicate that there is currently no ideal biologic for complex ventral hernia repair. Previous communication to meeting: Oral presentation at the 4th Joint Meeting of the American Hernia Society (AHS) and the European Hernia Society (EHS) in Berlin, Germany, September 2009.